We get questions all the time regarding the supervisory requirements for Independent Diagnostic Treatment Facilities (IDTF). Here are some tips in complying with one of the key elements in obtaining and maintaining status as an IDTF and as a Medicare provider. An IDTF must have one or more supervising physicians who are responsible for the direct and ongoing oversight of the quality of the testing performed, the proper operation and calibration of equipment used to perform tests, and the qualifications of non-physician IDTF personnel who use the equipment. Not every supervising physician has to be responsible for all of these functions. One supervising physician could be responsible for operation and calibration of equipment, while other physicians are responsible for test supervision and the qualifications of non-physician personnel. The basic requirement is that all the supervising physician functions be properly met at each location, regardless of the number of physicians involved. This is particularly applicable to mobile IDTF units that are allowed to use different supervising physicians at differing locations. They may have a different physician supervise the test at each location. 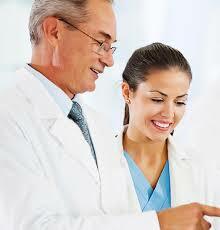 The physicians have to meet only the proficiency standards for the tests they are supervising. Your assigned Medicare carrier will use its discretion to determine if the supervising physician(s) meet the proficiency standards stated in the regulations. Supervising physicians do not necessarily have to be employees of the IDTF. They can be contracted physicians for each location serviced by an IDTF. (ii) Direct supervision in the office setting means the physician must be present in the office suite and immediately available to furnish assistance and direction throughout the performance of the procedure. It does not mean that the physician must be present in the room when the procedure is performed. (iii) Personal supervision means a physician must be in attendance in the room during the performance of the procedure. The law does not speak to this being a “supervision of the administration of contrast media”, but rather, is a distinction drawn as to the degree of difficulty in the performance and the interpretation of the procedure. This degree of difficulty is assigned to the levels of supervision and the warranted payment of the professional component of the CPT code. It is important to note the role of the supervising physician in an IDTF precludes any physician who does not have the specialized training required for the specific procedure from “supervising” the testing without documentation of additional training in this exclusive area of proficiency. A statement of “considerable experience…related to imaging…” will not suffice as evidence of proficiency in the performance of such testing. Questions have been raised regarding the use of radiology residents as supervising physicians in an IDTF. The carriers determined that a radiology resident does not meet the requirements of a supervising physician for an IDTF since radiology residents are in training and are not qualified to be supervising or interpreting physicians for any IDTF. Also, the IDTF must maintain documentation of sufficient physician resources during all hours of operations to assure that the required physician supervision is furnished. The carrier may ask for written procedures from the IDTF describing how this is being met. The bottom line is, if you want to get paid by Medicare, be sure your IDTF has detailed documentation of its compliance with the supervisory requirement and is actually putting in practice appropriate supervision at your facilities and out in the field. This entry was posted in Compliance Plans, Corporate Law, Department of Justice, FHLF Monthly Newsletter, Florida Statutes, Group Practice Concerns, Healthcare Law, Healthcare Reform, Healthcare Transactions, Independent Diagnostic Treatment Facilities, Medicare Issues, Physician Employment Issues, Physician Issues and tagged compliance, idtf, Medicare, mobile IDTF units, radiology residents, supervising physician, supervision requirements. Bookmark the permalink.